The song “I Want You Back” by The Jackson 5 is not just a great song but also reminds us that, through all the scandal and absurdity which that became Michael Jackson’s adulthood, he was a great singer and performer and none more so than when he was fronting his band of brothers. I also picked this song for another reason that seems so out of left field (which it is), but also fit in so perfectly to end two hours of an enjoyable time at the cinemas. James Gunn had personally picked the classic 70’s songs that would be part of mixtape for Guardians of the Galaxy. One such song is The Jackson 5’s “I Want You Back” and it’s use and timely appearance in the film also marks one of it’s most adoring sequences. I know for a fact that site co-founder Lisa Marie Bowman will love not just this song but the scene it gets attached too. I’m just hours away from watching an advanced screening of Guardians of the Galaxy on IMAX in San Francisco. What does this have to do with the latest “AMV of the Day” you may be asking? Well, the answer to that is really nothing. Nothing except that both this AMV, “Snowball Genocide”, is just as fun to sit back and watch as I’m sure James Gunn’s Guardians of the Galaxy will be. It helps that “Snowball Genocide” won not just the Best Fun/Upbeat category but also Best Concept video during Anime Boston 2014’s AMV contest this past March. 10 Reasons Why Sharknado 2 Was Sharktastic! Unless you’ve been living in total and complete isolation, you know that Sharknado 2 premiered on SyFy last night. And of course, I watched and live tweeted it. Now, when it comes Sharknado 2, it seems like everyone has one question: Was it better than Sharknado? Here are 10 reasons why Sharknado 2 was sharktastic! Sharknado 2 didn’t waste any time getting to the point. From the minute the film started with Ian Ziering and Tara Reid sitting in an airplane that’s hit some sharknado-related turbulence, Sharknado 2 was all about sharks falling from the sky. 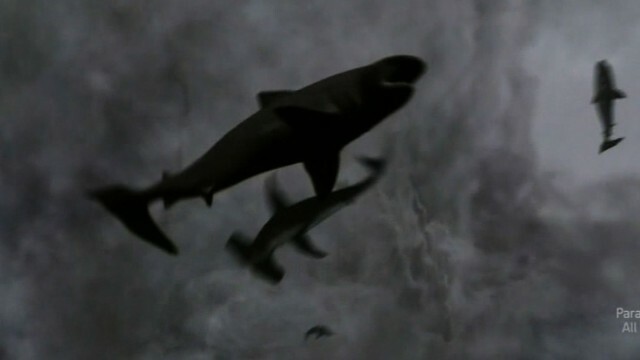 The film didn’t waste any time revisiting the events of the previous film or trying to explain, for a second time, how a bunch of sharks ended up in a tornado. And you know what? If you were worry about the logic of the situation then you really weren’t the right audience for this film. Sharknado 2 was a movie for those of us seeking nonstop shark mayhem and it delivered! When the first sharknado hit Los Angeles, we were presented with a portrait of a town that deserved to be destroyed. I mean — really, Los Angeles? A little bad weather and a few sharks and your entire population is screaming and fleeing? New York, however, knows how to handle a sharknado. It didn’t matter how many sharks fell from the sky — the citizens of New York refused to allow it to stop them from enjoying baseball games, visiting the Statue of Liberty, and seeking out a good slice of pizza. New York, you’re the tops! I don’t know about you but if a shark fell out of the sky and bit off my hand, I would probably freak out. Having watched Sharknado 2, I can say that I am definitely not as strong as Tara Reid. Though she may have lost her hand early on in this movie, she never let it slow her down. Not only did she defiantly walk out of the hospital but she also managed to drive a fire truck with only one hand! I’ve got two hands and I don’t think I could do that. Finally, as a perfect example of how to make lemonade out of lemons, she even replaced her missing hand with a radial saw that, as it turns out, was perfect for fighting sharks. You go, girl! In the first Sharknado, Ian seemed almost annoyed to be there. You got the feeling that he felt that somehow, by appearing in a movie about flying sharks, he was somehow damaging his career. 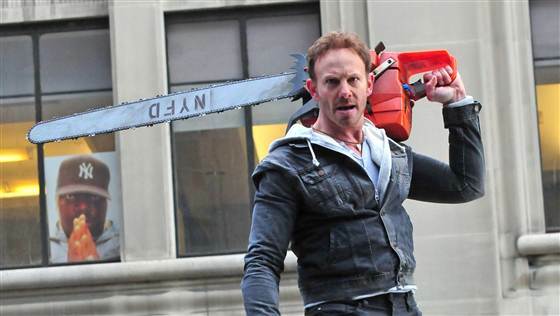 In Sharknado 2, however, Ian brought a lot of conviction to his role. Though it may be hard to understand if you haven’t seen the actual film, I’ll just say that you looked at and listened to Ian and you believed that this man had indeed been inside of a shark. And you better believe that head went rolling down the streets of New York. I am a little bit disappointed that Ian never found a moment to stare up at headless Lady Liberty and shout, “You blew it up! Damn you to Hell!” but oh well. 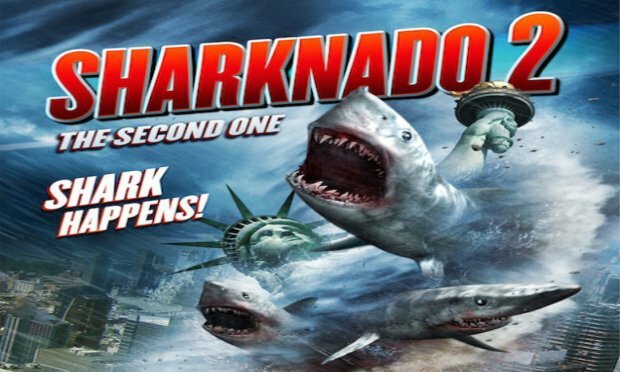 Seeing as how the first Sharknado became a bit of a pop cultural phenomena, we should probably not be surprised that a lot of celebrities agreed to do cameos in the sequel. What should surprise, however, is just how well the cameos were integrated into the film. Whether it was Kelly Osbourne getting eaten by a shark or Matt Lauer and Al Roker arguing over the proper name for the storm (eventually, Matt did call it a sharknado and you can see just how happy Al was; it was a touching moment), all of the cameos worked brilliantly and, even more importantly, they didn’t distract from all of the shark mayhem. 7) The Live Tweeters Were On Fire Last Night! Especially me! Seriously, Sharknado 2 brought out the best in me. To be honest, the entire cast brought their A game to Sharknado 2. Everyone from Vivica A. Fox to Mark McGrath to Kari Wuhrer to Tara Reid to Judd Hirsch to well, everyone seemed to understand that for this material to work, they had to be willing to say some of the most ludicrous lines imaginable with a straight face. If a single member of the cast had tried to wink at the audience or play up the film’s inherent campiness, the entire film would have fallen apart. Instead, everyone brought a lot of conviction to their roles. Instead of mocking the film and their dialogue, you could tell that they were instead having fun with it and, as a result, the audience had a lot of fun as well. Proof positive that high heels can be a girl’s best friend. And you know what that means: SHARKNADO 3! ‘Interstellar’, directed by Christopher Nolan (‘Inception’, ‘The Dark Knight’), stars Matthew McConaughey, Jessica Chastain, Anne Hathaway, Casey Affleck, Michael Caine and many others. It is set in a not so distant future in which resources on earth are running low and a group of astronauts/explorers blast off to utilize “wormholes” to find habitable and resource rich planets outside of our solar system. The music is by Nolan’s go-to composer Hans Zimmer, and the cinematography by Hoyte Van Hoytema (‘Her’, ‘Let The Right One In’). I personally love astronomy and astrophysics. I love space, and have a mild obsession with Saturn. So when I say I am excited for ‘Interstellar’ it isn’t just because I am a fan of Nolan, or I am wrapped up in the wave of hype that tends to surround his films. I have a genuine personal interest in the science and themes involved here and so my expectations for this, even with all the confidence I have in its (amazing) cast and crew, are probably higher than any other release in 2014. Luckily the first full length trailer was beautifully made and was exactly what I wanted to see; and now this new trailer (which showed at Comic-Con) expands on the first, offering us even more of a glimpse as to what we are to expect…and boy oh boy does it look amazing. It has a genuine ‘Inception’ meets ‘2001: A Space Odyssey’ tone and look to it; and I can not wait to see those visuals in IMAX. Sadly it doesn’t hit theaters until November 6th…but until then I’ll be sitting here, with the trailer on loop *cries*. And that’s not a bad thing at all! Believe it or not, before I sat down to write this post, I actually did some research on the origin of the song. And, of course, by research I mean that I looked the song up on Wikipedia and read the first half of the article. Spirit in the Sky was written, recorded, and first released in 1969. Norman Greenbaum mostly wrote it as a challenge to himself, to see if he, despite knowing nothing about gospel music, could write a gospel song. As for the song’s distinctive “beep beep” fills, they were the result of a last minute improvisation by guitarist Russell Dashiell. The end result, of course, was the world’s first psychedelic gospel song. Finally, before Greenbaum recorded Spirit in The Sky, he apparently had a hit song called The Eggplant That Ate Chicago. And who knows? Maybe that song will be featured in the trailer for the sequel to Guardians of the Galaxy! Here’s The Trailer for Whiplash! Whiplash is one of those films that I’m truly looking forward to seeing later this year. Not only is Miles Teller a star waiting for the perfect vehicle, but rumor has it that the great character actor J.K. Simmons might get some Oscar consideration for his performance. And the trailer looks great! At this point, does it even matter what scenes they put into the trailer for Mockingjay? I mean, we all know that we’re going to see it and we’re probably going to love it, right? They could probably release this film without doing a bit of advertising and it would still make box office history. Here’s the latest teaser f0r Mockingjay! It’s interesting to note that, along with the expected emphasis on Jennifer Lawrence, the trailer really is dominated by Philip Seymour Hoffman.